Empire Film is an occasional series in which I write about the imperial meanings (whether intended or accidental) of films from across the decades, during the age of empires and into the present day. 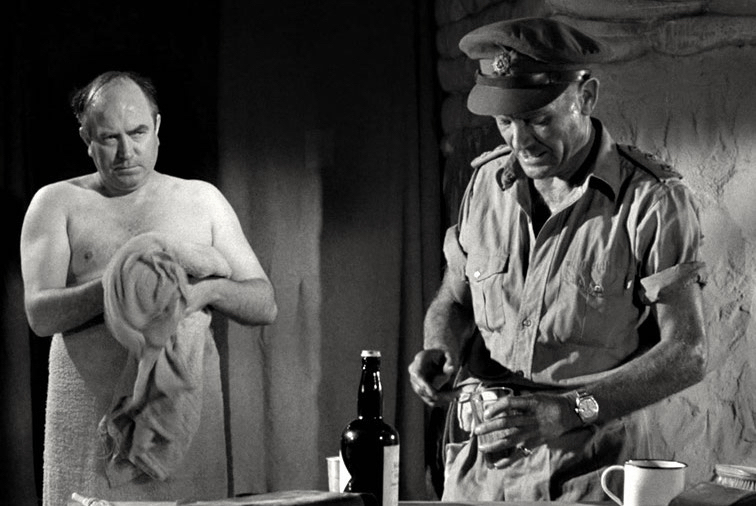 Widely regarded as one of the best war movies of the 1950s, Ice Cold in Alex (1958) is not obviously an ‘empire film’. However, I argue here that it in fact reveals a great deal about British anxieties over an unstoppably transforming world as the imperial age approached its demise and British supremacy was at an end. Set during the North African campaign of the Second World War, when the British Eighth Army fought the German Afrika Korps in the Libyan desert, the action begins just as the important Mediterranean port of Tobruk appears about to fall under siege. Following a series of minor mishaps, Captain Anson (John Mills) finds himself in charge of a ragtag assortment of escapees: a mechanic sergeant major, two nurses, and a ‘South African’ officer who is gradually revealed as a German spy. They must flee to safety in Alexandria, far across the desert, in a somewhat knackered old ambulance. The basic narrative of the film becomes the challenges they experience in avoiding the enemy, coping with the harsh desert terrain, and overcoming a series of vehicular mishaps. Before the story gets properly under way, we learn that Captain Anson is an alcoholic, and the director – J. Lee Thompson – spares no effort in driving this point home: Anson is shown reaching for his whisky bottle a mere 34 seconds after first appearing on screen; six minutes later, we have already seen him drinking on three separate occasions with no less than three different drinking companions, including his corpulent and towel-clad commanding officer fresh from the bathtub. 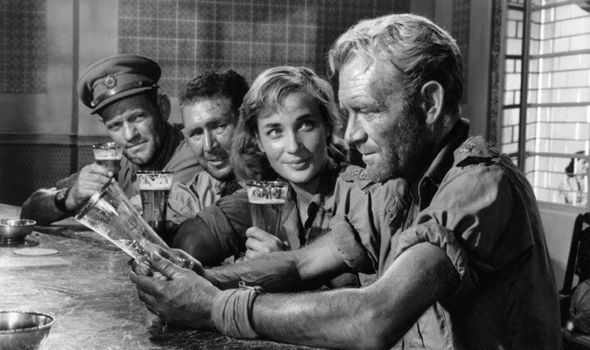 Less than ten minutes into the film, the stalwart sergeant major (Harry Andrews) decides that Anson has “had just about enough” and puts him to bed for a little nap... Captain Anson’s alcoholism is so important a theme that it supplies the evocative title of the film, which refers to his lusting after the cold lager in Alexandria that will mark the end of their journey. This important rôle of alcoholic drink strikes a chord with many other representations of empire, in both literature and film, in which booze is consumed in surprisingly generous quantities or with a particularly grim determination – think, for example, of Graham Greene’s The Heart of the Matter (both book and film), in which Scobie has an evident fondness for a whisky, and Pemberton drinks himself to suicide. So common is alcohol in tales of empire that I have come to see it as a form of self-medication reflecting not only the stresses of work experienced by a servant of empire in the field, but also the overwhelming need for such a man to lubricate the passage of his conscience into a decent night’s sleep; the exercise of autocratic rule over a subject population must surely take a psychic toll, even if entirely subconscious. Some selective amnesia, through the aid of a regular glass or two of ‘forgetting juice’, must in those circumstances be welcome, and a necessary aid to making it to the end of a tour of duty. In a similar way, Ice Cold in Alex is itself guilty of not looking a potentially awkward subject directly in the eye: nobody – neither characters in the film nor producers of it – feels any need to enquire why Captain Anson et al find themselves fighting in Libya, nor any need to explain it to the audience. Of course, as will generally be known, British soldiers were in North Africa to defend Egypt and the Suez Canal, that great prize of imperial logistics; this is, at its simplest, why I class this as an ‘empire film’. If one spends just a moment considering it, however, it is remarkable that at the time it should be thought quite normal that a few otherwise perfectly ordinary English people were to be found being chased by Germans through the Libyan desert – actually rather a strange circumstance, by any measure. This absence of a need for explanation (an unquestioning attitude shared by most films and books of the imperial era) is in fact, in my view, one of the most powerful achievements of the British Empire: the mental landscape for all those involved had been shaped around the Empire as a fixture, something inevitable and unmoving, and surprisingly few people (even amongst the subject populations) even considered the option of disputing that fact, or challenging its existence. The capacity to prevent itself even becoming a matter for discussion in a popular movie as late as 1958 is a notable demonstration of the insidious strength of the British Empire and its supporters in determining mainstream opinion for many generations. This response seems suggestive of an awareness that there is a problem – circumstances driving British officers to behave in ways that are both unrecognisable and unacceptable – but not yet an understanding of the reason for it. There has been a detectable change in the universe, a shift in certainties, but the nature of it is not yet properly defined, or perhaps is too troubling to address directly. This is why I believe that the film must be understood as deeply revealing of (largely unspoken) British attitudes to the world of the late 1950s, rather than its avowed subject of the Second World War. Ice Cold in Alex was made in the immediate aftermath of the humiliating Suez Crisis of 1956, in which Britain and France had tried and failed to exercise imperial power over Egypt. Just ten years earlier, Britain had retreated from India, losing what was easily its most prized colonial possession; although much of the Empire remained, decolonisation had begun with a vengeance. Moreover, having spent the best part of two centuries as Top Nation, Britain entered the 1950s having been suddenly and brutally demoted. With the United States emerging from the Second World War as the new global paramount power, Britain had been relegated; it cannot have escaped the notice of the 1950s cinema audience that Britain – once used to coming first as a matter of routine – was only the third country to acquire nuclear weapons (and in fact only gained an operational H-bomb in 1961). In these circumstances, we are tempted to see the scruffy old ambulance as symbolic of the Empire: well past its prime and no longer completely roadworthy. As the sole representative of the English officer class among the desert escapees, Anson embodies Britain herself in 1958: somewhat battered, struggling to keep things together, no longer possessed of quite the same authority. At one point in the film, the working class sergeant major (who, significantly, remains thoroughly reliable and undaunted throughout) tells one of the nurses that the captain has “just about driven himself to a standstill”. This may have resonated with the cinemagoer of 1958, who was surely aware that at the time Britain was fighting the Mau Mau Rebellion in Kenya, the communist insurgency in Malaya, and the EOKA guerrillas in Cyprus, as well as other increasingly desperate campaigns, all in an effort to hang on to the remains of Empire. This sense of decline seems to be emphasised in Ice Cold in Alex by the way in which, during the period when the supposed South African officer, Captain van der Poel (Anthony Quayle), is believed to be a colonial cousin, he is shown repeatedly demonstrating his physical superiority over Captain Anson, who appears comparatively frail, even vulnerable. At one point, Anson actually faints – traditionally an unimaginable eventuality for a British officer – and van der Poel carries him to safety. This seems to express a feeling that younger colonial offshoots, more robust and energetic, were superseding the tired old imperial paterfamilias. It should of course be remembered that the United States was itself an offspring of the British Empire and had recently elbowed aside its estranged parent to claim world leadership. The ending is surprising for a 1950s war movie, and seems rich in meaning, though perhaps not the one intended. Four of the ambulatory refugees finally make it to Alexandria and enjoy the much anticipated lager; the Brits have realised that van der Poel is a German spy but, having come to respect and value him, they conceal that salient and damning fact and have him arrested as a plain old prisoner of war, thus saving him from a firing squad. With the aid of a rather mawkish voiceover, a strong note of the brotherhood of man is introduced in the closing scene, and we are told that the desert is in fact the greater enemy. Given the evident British imperial anxieties and status insecurities that came earlier in the film, this conciliatory tone strongly suggests a chastened post-Suez Britain, uncertain of its place in the world as the great imperial adventure winds down. Britain had won the war, but seemed unsure about winning the peace. Ice Cold in Alex, 1958, directed by J. Lee Thompson and produced by W. A. Whitaker for Associated British Pictures. Black & white, 130 mins.